How to Make Easy Nasi Kuning Special Sedap .People named yellow rice because the rice yellow. 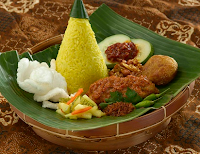 Yellow rice taste one of the dishes typical of Indonesia. Ingredients yellow rice is almost the same as the materials coffè, only yellow rice with saffron added which will give a yellow color to the rice. The yellow rice was promoted areas of Java island, therefore, on the island of Java is very popular with yellow rice dish. Usually the yellow rice used for the breakfast menu. Because in the mornings we often see yellow rice was diwarung-diner which is located alongside a-side street. Of course, yellow rice taste better than ordinary white rice, especially if the materials are complete, fit pokonya banger was great, nah friends disusantara we try to make yellow rice itself, let's look at this dibawang recipe. We enter the rice that had been cleaned in a pot and then water, coconut milk, lime leaves, bay leaf, pandan leaves, lemongrass, clove, cinnamon, nutmeg and turmeric that has been refined, then enter stir the garlic and salt we peck amount of water in pan using 2 segment of the index finger of the rice and then we cook until reduced water and shrinks or becomes nasi aron. After that we move into the aron rice steamer pot we steamed for about 15 minutes until the rice becomes tender and fluffier. If the rice is ripe we waste materials spices and leaves us stir the rice then serve in the plate and bari additional materials appendages such as tempeh, tofu, chicken, eggs seasoning red, fried noodles and fried onions and fried chilli or materials -material menutrut complement your tastes. The yellow rice was exactly was making, how to cook it the same way as regular white rice memasakn, just that there are certain additional materials, okay good luck and make. Thanks. 0 Komentar Untuk "How to Make Easy Nasi Kuning Special Sedap"